During the holidays it’s easy to get off track with eating. Going to Thanksgiving you can’t deny the entire table of desserts, right?! But sometimes with all the wonderful get togethers and travel, food choices are not at their best. Detoxing can be a popular term for wanting to get rid of junk we have been consuming. Really, what we are saying is that we have been loading up on toxic food and drink, which our bodies can’t break down efficiently and we need to cleanse. This can look like headaches, bloating, gas, low energy, brain fog, weight gain, unable to lose excess weight, constipation, stomach pain, etc. I personally try to eat clean as much as possible with buying as much organic as I can and eating a paleo lifestyle (no gluten, dairy, refined sugar, and consuming grass fed animal products), but there are some helpful things to hone in on when wanting to detox. I actually encourage you to add these 5 things into your diet on a regular basis so you can live healthier and more detoxified all the time. We know that approximately 75% of our bodies are made up of water. That means our bodies NEED it. When we indulge at certain times of the year, what do we load up on? Soda, alcohol, sugar, and over-indulging of our favorite foods. Our bodies are craving water because it is used in the digestive process to push food through and produce waste, our kidneys need it to function properly, and every cell needs it as well. So if you want to detox from holiday cheer, start with water, 64 ounces in a day at minimum. When you wake up, drink 8-16 oz of water before grabbing your coffee. This one might also seem obvious and it is for good reasons. Getting your heart rate up not only burns calories to help you lose weight, but it pumps blood through your entire body and works important muscles and organs, which makes them stronger and work better. We need this when wanting to detox. Exercise also produces sweat, which is beneficial for getting rid of toxins, and helps move the digestive process along at a faster rate, removing waste sooner from our bodies. So get in a 20-40 minute workout several days and challenge yourself with new things like Interval training and weight lifting. There’s a buzz about probiotics these days. Well these strains of “good” bacteria are very important for our health and beneficial for detoxifying. A lot of times we think of bacteria as only being something bad that we need to fight off. This is why we have our kids wash their hands before eating dinner, why we are careful in certain environments, etc. We work so hard at avoiding the “bad” germs that putting in the “good” germs, or bacteria, get left out of the conversation. This is where probiotics come in. They are responsible for helping us fight off sickness, they carry out heavy metals from our bodies, and a whole host of beneficial things that fight invaders and inflammation our bodies do not want. Where do we get probiotics? The best place to get them is food sources. Yogurt touts a lot about having probiotics, which is true, but it can be a tricky one if you’re eating it for the probiotic benefit (see food sources link below for more info). You can certainly invest in probiotic supplements as well, and I take one on a regular basis myself but I do try to get it in my food. Things like kombucha, kefir, apple cider vinegar, and fermented foods like sauerkraut are food sources. There is so much more to say about probiotics and here’s a link for more information about how they work. Here’s another link for the food sources. Drinking fresh vegetable and fruit juices have incredible benefits. We discussed probiotics above, which is good bacteria, and juicing contains prebiotics, which feeds the good bacteria. I think this is a win-win situation! 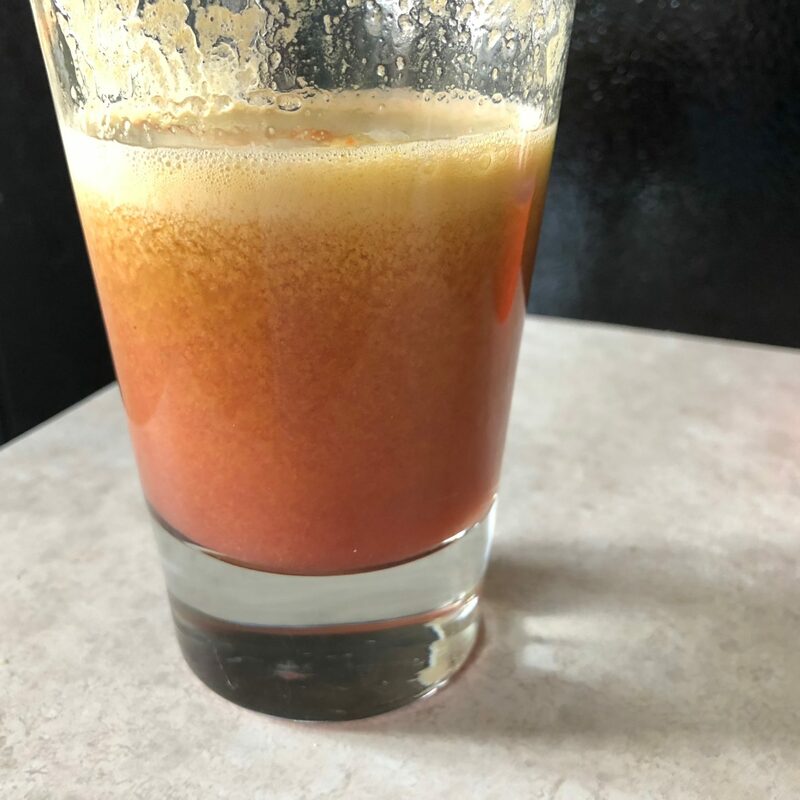 Juicing is also a great way to get in a variety of vegetables at once and even hide the taste of some you may not be too fond of. So how do we do this when detoxing? I like to mix fruit in with vegetables to help the taste be sweeter. Keeping in mind a budget is a good idea as well because juicing can use up a lot of fruits and veggies for one cup. I will buy bags of full size carrots, use tomatoes, zucchini, and cucumbers as a large “base” for my juices. [Try to buy as much organic as possible so you avoid pesticides.] These are things that aren’t expensive and produce a larger amount of juice. Then I add things like apples, oranges, grapes, or berries. Juicing is actually really great for “extras” in your fridge that will go bad if you don’t throw into the juicer. Such as half a tomato, or the broccoli stalks you don’t want, etc. Other detoxifying things you can add are lemon, lime, ginger root, turmeric, and cinnamon. You can buy the actual roots of ginger and turmeric and cut a small piece off to add in with your other fruits and veggies. I think they add good flavor. Ok, what is bone broth? It is a stock that is made from bones, cartilage, ligaments, and feet by boiling and simmering in water over a couple days. Adding vegetables and herbs is optional for creating more robust or different flavors. You make broth with chicken bones, turkey, and beef bones. Homemade broth has SO MANY health benefits. 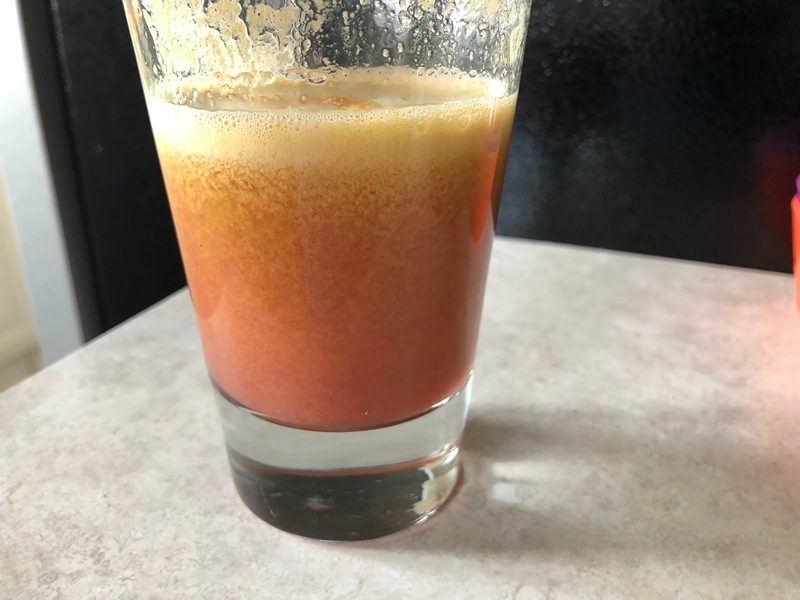 When I was diagnosed with Hashimoto’s last year, I finally learned how important bone broth was. I never really knew even though I have been in the fitness and nutrition field for close to a decade. Simmering the bones releases collagen, gelatin, glucosamine, glycine and a host of minerals. Glycine helps produce something called Glutathione, which is responsible for detoxifying your liver. It is basically your body’s “master” antioxidant. Bone broth also helps your joints, reduces your body’s inflammation, and repairs your gut lining, which is extremely important for auto-immune diseases and IBS. It also helps your hair, nails, and skin grow. If you follow my IG or FB pages, you’ll see photos of my hair growing back and I really attribute most of this from consuming bone broth (I do not use extra supplements or special hair products to help my hair growth). How do you make bone broth? Anytime you use meat with bones, SAVE THEM. Turkeys from Thanksgiving or Christmas time? Get your hands on those carcasses. You can also go to a local butcher and buy bones. I go to one near me called DC Meats and buy bones. You can freeze them until ready to make. You can buy bones very inexpensively. There are some products available to get “broth” or gelatin into your diet when you aren’t consuming homemade stock (store bought package broth is NOT the same as homemade unless specifically sold as a fresh made stock which would probably be at a local organic store or butcher shop). 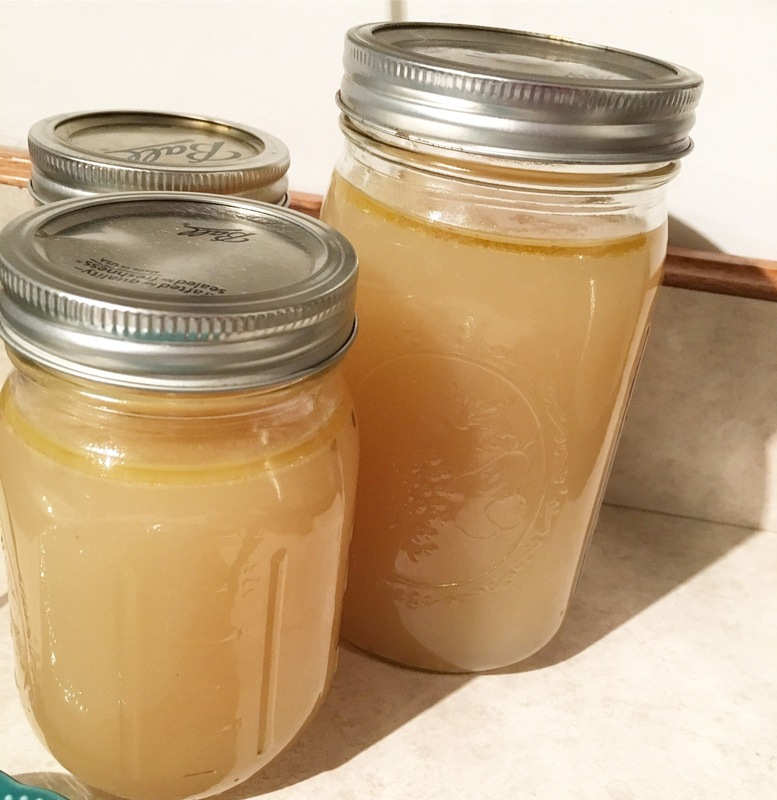 Homemade bone broth should gel and be jiggly almost like jello, once cooled. That is a sign of a quality batch. How to consume broth everyday? Drinking it straight up, or putting it in things when cooking will work. Add it to scrambled eggs before cooking them, use as the liquid when making mashed potatoes, adding in soups, chilis, paleo pot pie, or have it be in place of water when steaming vegetables. You want to get 1/2 to 1 cup a day of broth. 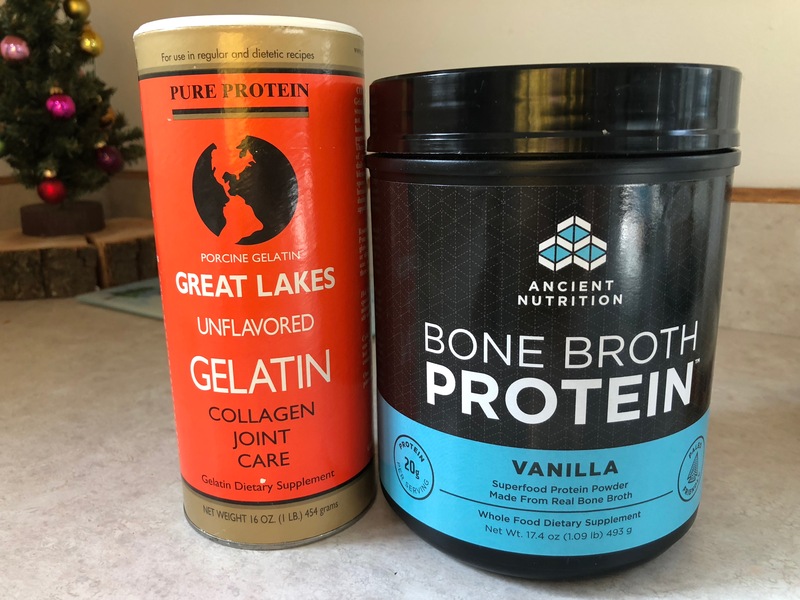 Other bone broth sources are gelatins and protein powder. Great Lakes brand of unflavored gelatin is a good quality kind. You can add it to drinks or I like to add in my hot teas. I also use broth protein powder. It does not taste gross and in fact, I like it in my smoothies. Alright, we have gone over quite a bit of information. Putting it all together for detoxing? Let’s say you start tomorrow. Wake up, drink 8-16 ounces of water, get in a good workout, take a probiotic supplement or buy a kombucha drink and drink about half of it at lunch. Then juice for an afternoon snack and steam your vegetables at dinner with bone broth. Make sure you get plenty of water throughout the day and try to eat as close a diet as paleo to keep inflammatory foods out of your system. Do this for 3-7 days and you’ll be detoxing for sure! Feel free to ask me questions if you have any!